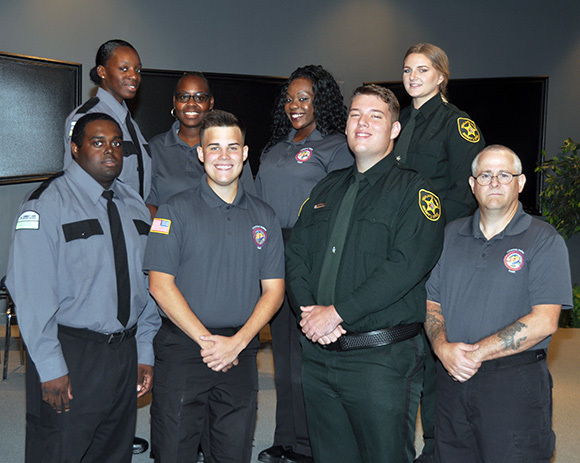 AVON PARK, Fla. – Oct. 19, 2018 – South Florida State College (SFSC) graduated eight new correctional officers on Thursday, Oct. 18, at the Highlands Campus in Avon Park. From the SFSC University Center Auditorium stage, Michael Austin, coordinator of SFSC’s Criminal Justice Academy, called up the eight and handed each new officer a certificate. Those receiving a certificate were class leader Theodosia Shannon; executive officer Robert C. Hamby; first squad leader Tanner Fitzwater; second squad leader Cornell Santiago; Roman Donaldson; Sumera Lewis; Neil McDaniel; and Ashlee Robitaille. Two cadets were singled out for their achievements during the 420 hours of instruction. Earning top honors for academic excellence were Ashlee Robitaille and Theodosia Shannon, and for top firearms for her work on the shooting range was Ashlee Robitaille. Theodosia Shannon was given special recognition as class leader as was Robert C. Hamby as executive officer. Guest speaker for the ceremony was LaKisha Collins, correctional probation senior officer with the Florida Department of Corrections. Addressing the cadets, Collins said, “Each of you have transitioned from being regular citizens to successfully completing basic corrections academy. You have sacrificed a lot over the last three months and come successfully to this point in your life. Please don’t throw it all away by forgetting the rules and the sworn oath that you’re going to take once you take on this profound career.